You are here: Home / Nutrition / Is caffeine safe in pregnancy? There are lots of ‘dos’ and ‘donts’ that you will face as soon as you fall – or plan to fall – pregnant. Lists of foods to include and foods to avoid… advice on what you should drink and how much…. the types of exercise you should be practising… specifics on how much sleep you should be getting… the list goes on. All of this – well, most of it – is well meaning and intended to keep you and your incubating child healthy. Too easy, right? Maybe. Sometimes this information and advice is conflicting, and often it is overwhelming for women and their partners. One topic that comes up extremely often is the question around coffee and other caffeinated drinks, and whether they are safe to drink while pregnant. Well, let me weigh in on this. 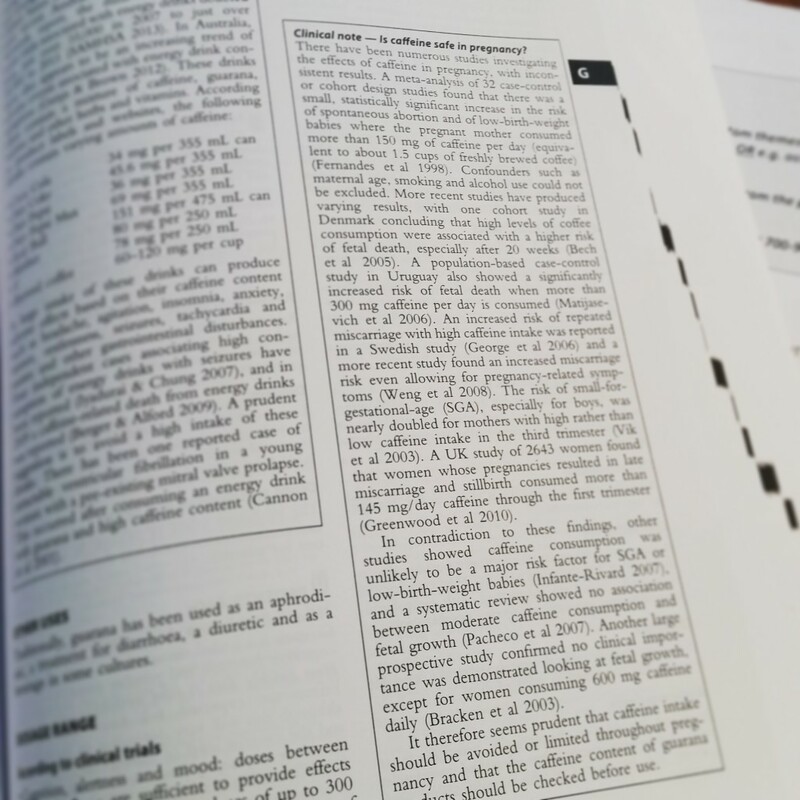 I recently contributed some herbal and nutrient monographs to the text book Herbs & Natural Supplements: an evidence-based guide. One of these was on guarana, that well known energy tonic, and within that review we included a discussion on caffeine, health and pregnancy. I’ve included snapshot of the evidence below, but to summarise: high levels of caffeine consumption are associated with negative health outcomes (and therefore not recommended), whereas a low or limited intake seems OK. In clinic, I always recommend limiting coffee and other caffeinated drinks during preconception, pregnancy and while breastfeeding, but total avoidance isn’t necessary. However, for some people, it is better to cut out caffeine-containing drinks altogether – it really depends on the person. That’s the beauty of individualised treatment!